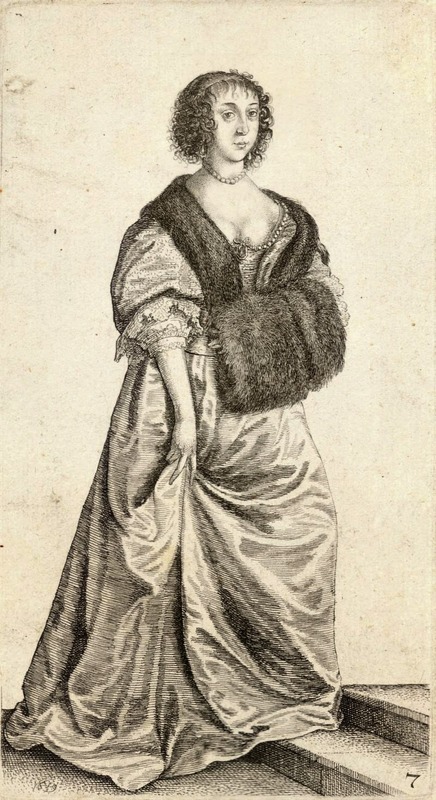 In order to understand early modern undergarments, it’s also vital to understand the outergarments that were worn. 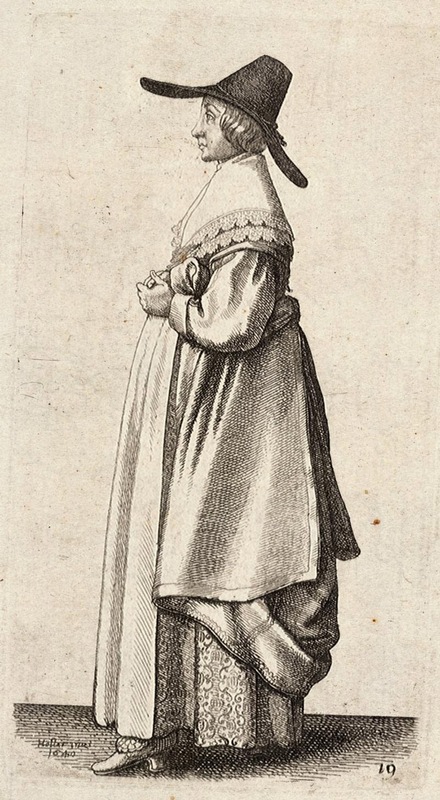 In order to better educate myself I’ve recently been going through some of the engravings done by seventeenth-century artists, particularly the Bohemian Wenceslaus Hollar who worked extensively in England, and Abraham Bosse, a French engraver. I love, love, love the engraving styles of the early seventeenth century, and particularly the styles of both the artists that I’ve mentioned. 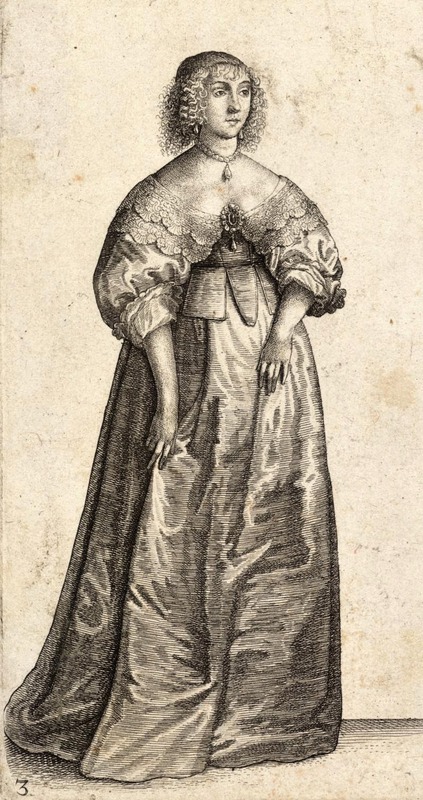 As a historian working on dress these types of engravings are also particularly useful to understand what types of clothing people wore and how they wore it. Although, keep in mind, that as an artistic medium these drawings can be prone to exaggeration or artistic licence. However, for the most part Hollar seems to have liked to draw people from all walks of life and in various social situations, so you can assume that they must have been somewhat realistic representations. The prints below come from a particular work Ornatvs Mvluebris Anglicanus or The Severall Habits of English Women, from the Nobilitie to the contry Woman, as they are in these times, 1640. Although the British Library also dates some of the pictures to 1638. In all probability, many of these engravings were first sketched in the late 1630s and not published until 1640. There are no captions that accompany the pictures, but they appear to progress from elite dress to common dress and that’s how I’ve ordered the ones below. 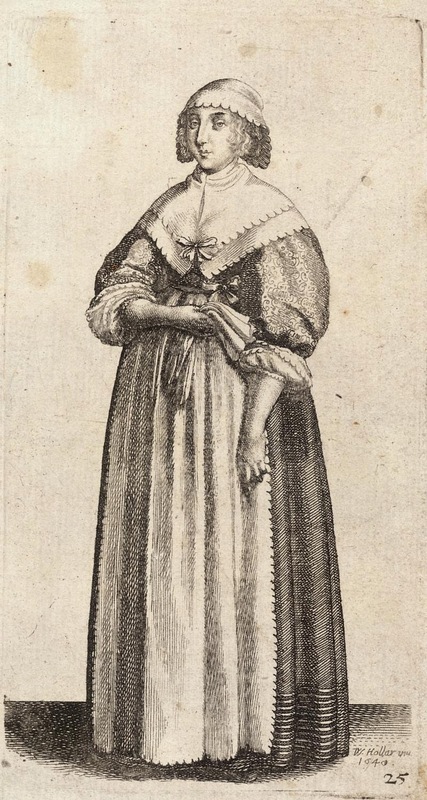 All of the pictures and more, are available via the University of Toronto’s Wenceslaus Hollar Digital Collection. 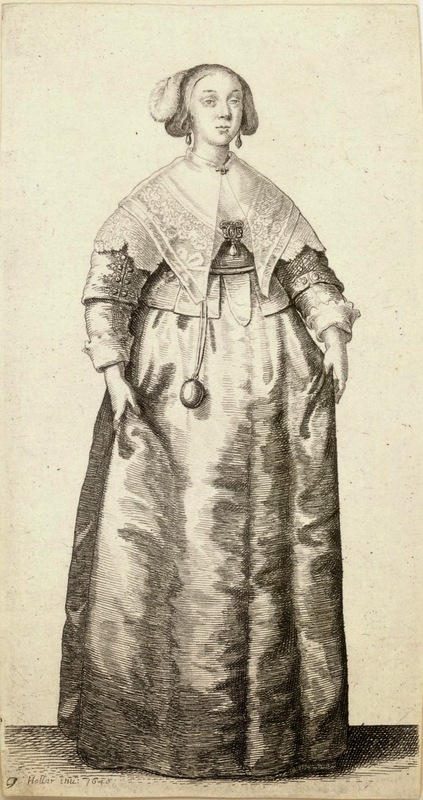 These fashionable elite women both wear the gowns of the 1630s that consisted of bodices with high waistlines and elbow-length full voluminous sleeves, a stomacher, a petticoat skirt and a falling lace collar. 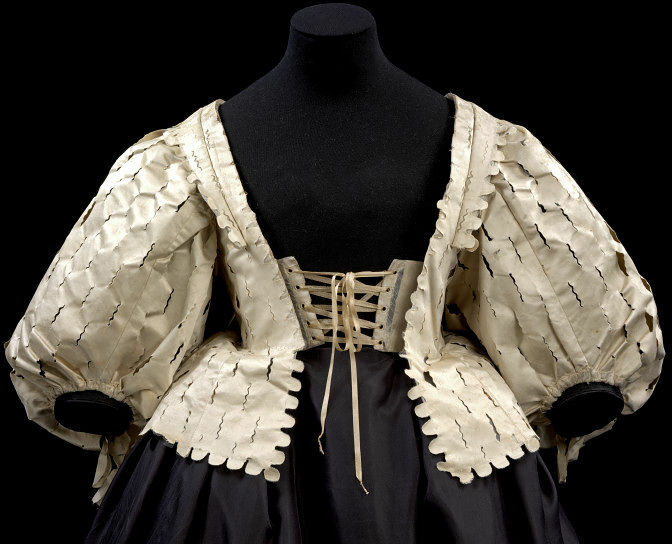 The bodices were often boned, as the extant example from the V&A is below with whalebone, buckram and canvas, and the stomacher would also have been stiffened with heavy fabrics, whalebone or a busk. Although it seems that the bodice of the gown could also be incorporated into the skirts as the picture of the woman on the right depicts. 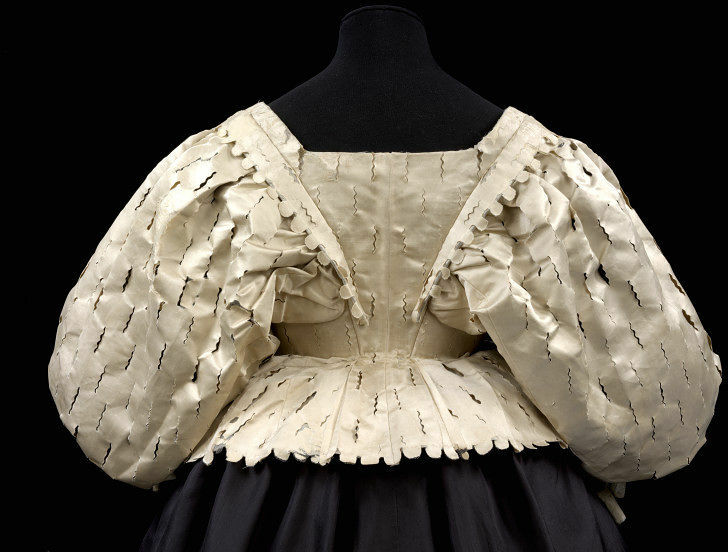 A tailoring bill for Queen Henrietta Maria from 1634 mentioned “one Gowne of black satin, The Sleeves, Stomacher and forepart with a lace throughout.” Women also wore foundational garments underneath such as the bodies belonging to Dame Elizabeth Filmer at the Manchester Galleries. So it left me wondering – what is a hungerline? This is where my French comes in handy. According to French sources, a ‘hongreline” was a short French-style waistcoat that was derived in style from the justaucorps which was a coat worn by men (by 1690 it was described in Antoine Furetière’s dictionary as a short-sleeved shirt with large tabs). Alfred Franklin in Corporations ouvrières de Paris Du Douzième Au Dix-Huitième Siècle (1884) noted that it was common among rural women and servants in France. 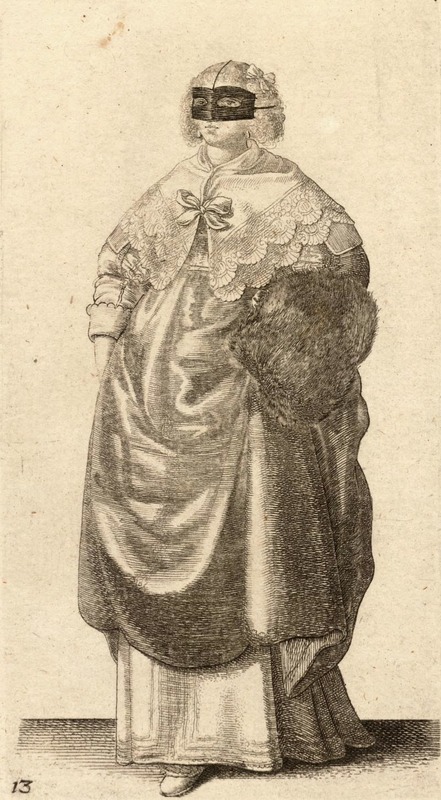 However, considering there is ample evidence of it in Henrietta Maria’s wardrobe and it is depicted on bourgeois women (see below), it seems that it was popular even among the upper classes. The style was probably brought to England by the French Henrietta Maria when she married Charles I in 1625. The only visual image I’ve been able to find that depicts a hungerline is this French one, from 1629, which unfortunately only gives us a side view. Isaac Briot, 1629. Bibliothèque nationale de France, Paris. Some French sources state that the main features of the hongreline was it’s “basques grandes/flottantes”, ie. the large and flowing lower part of the bodice. 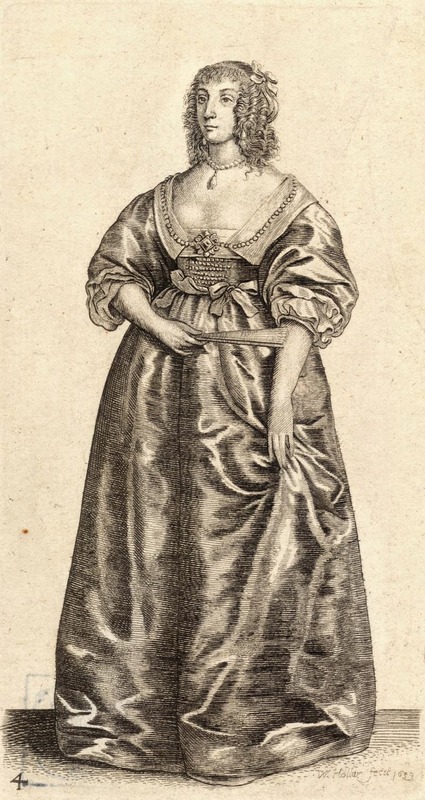 However, the main difference I can see between a hungerline and a normal gown bodice or waistcoat, and the reason I have chosen Hollar’s picture above, is the sleeve detail. The drawing above depicts a sleeve that contains two parts – the bigger embroidered upper sleeve that stops at the elbow, and a lower sleeve that comes out from underneath and finishes at the wrist. 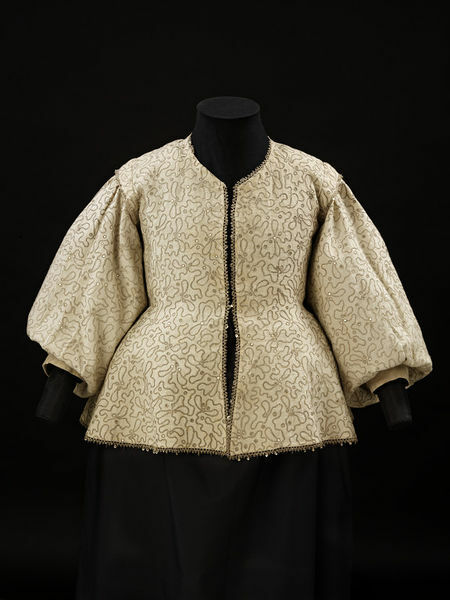 The sleeves also seem to have been heavily embroidered as description in Henrietta Maria’s bills describe, and maybe even had decorative button detail that mimicked a man’s coat sleeves, as is very obvious on the next picture below. It may well be though that this style is one that will never be completely recovered from history. 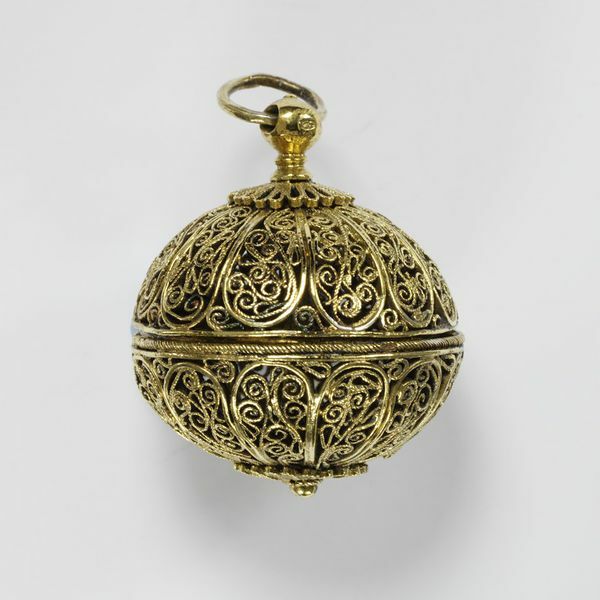 Pomanders (from the French pomme d’ambre) were items of jewellery that contained fragrant aromatic substances such as ambergris, musk, clove or civet, and commonly hung from the neck or the waist. Popular since medieval times they were believed to ward off infection during times of plague (as it was thought that disease was transmitted through foul air). However, by the eighteenth century they were used mostly to cover up bad smells, particularly in cities such as London were the streets were often filled with household waste and excrement. They also took part in the social etiquette practices of the day. This woman wears a waistcoat, a petticoat, falling lace band and also holds onto a fan. More interestingly though she appears to have a purse dangling from her waist. 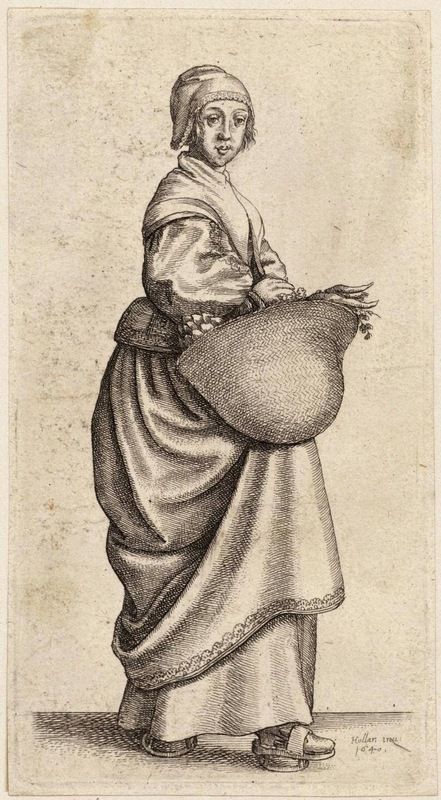 In the seventeenth century purses such as this were rarely used to actually carry money, as women such as the one depicted in this engraving rarely engaged in commercial exchanges that required cash. These purses could also contain mirrors (which is probably indicates what it was most commonly used for). They could also be used to carry around sewing materials or sweets, and other bits and pieces. 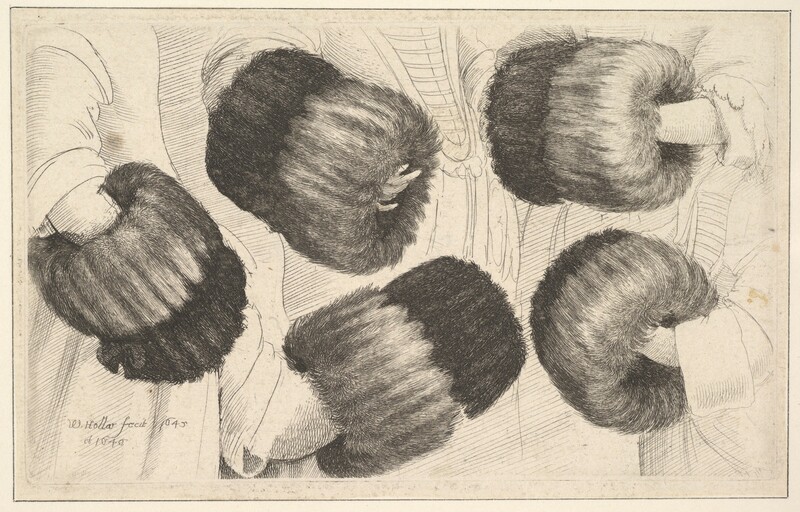 In fact that there are SO many engravings of muffs by Hollar. 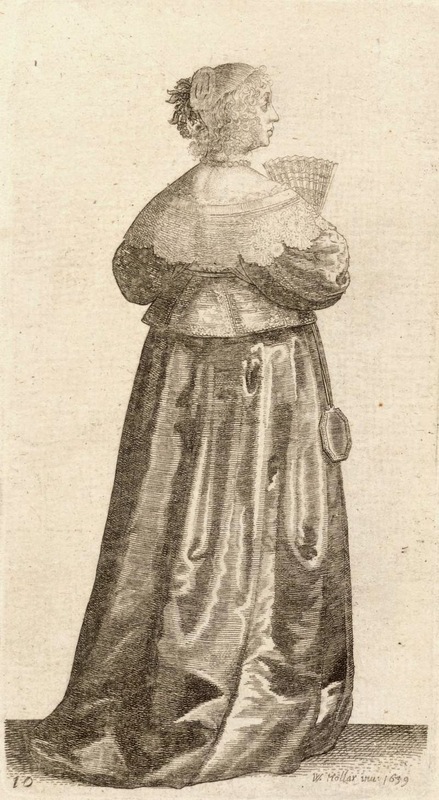 It would seem that really really liked women’s muffs (double entendre intended)! The woman on the left wears an over cape, a muff and has a purse dangling from her waist. Whilst the woman on the left wears a fashionable gown with a falling lace collar and holds a muff. What both women have in common is that they are wearing masks. Masks were, believe it or not, worn frequently in the streets of England during the late sixteenth and seventeenth centuries. 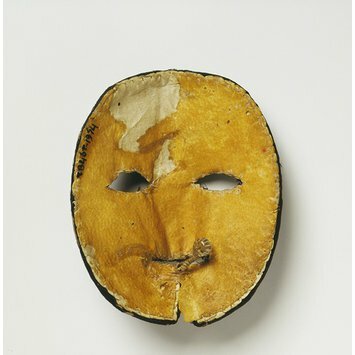 Full faced masks were used primarily to shade the wearer’s face from the sun’s rays, as the wearers were usually aristocratic women whose pale skin reflected their position in life. They were held in place on the face by holding a glass bead that was attached to the mask between the teeth, which would have made it quite difficult to talk! 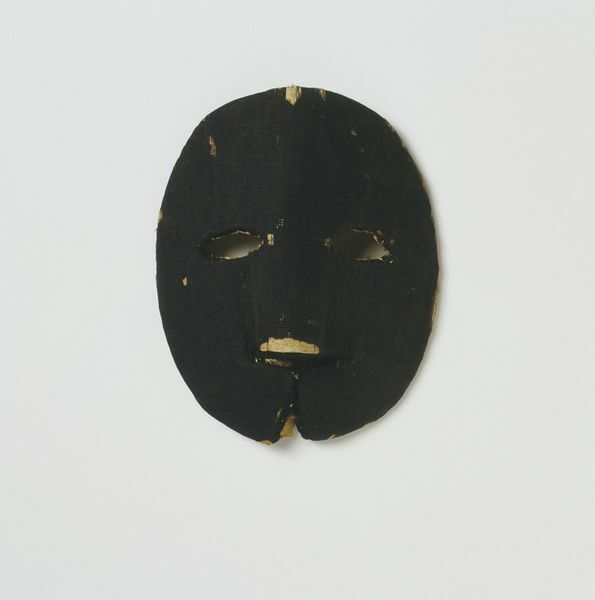 Some of these masks have survived and were made from black velvet and silk/leather, such as this one found in the wall of a sixteenth-century building in England. Or the one below which comes from a fashion doll and dates to the 1690s. Hats like this were worn by both men and women during the seventeenth century. Hats could be made from felted beaver or rabbit fur, such as the one from the Victoria and Albert Museum below, or from leather such as this example also from the V&A. They could also have really tall, narrow “steeple” crowns such as this one which were favoured by the Puritans who wished to distinguish themselves from the ostentatious cavaliers. 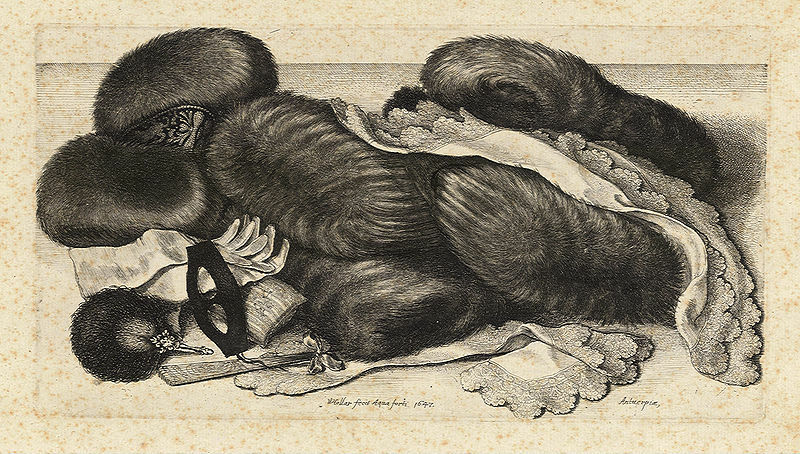 Over the course of the seventeenth century vast amounts of beaver fur used in hat making in Britain was imported from their colonies in North America, making them more affordable as the previous European Beaver was scarce as it had been nearly hunted to extinction. According to the V&A the felting process involved the fur being removed from the animal pelt and then heated to fuse it together. It was then moulded into shape around a wooden form, dyed, trimmed and smoothed. The woman in this picture is most likely a middling class city woman. 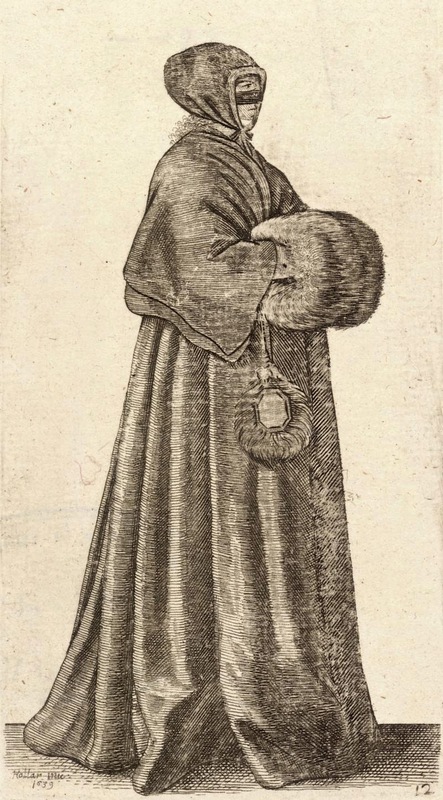 Felt hats were common among all classes of people in the seventeenth century. 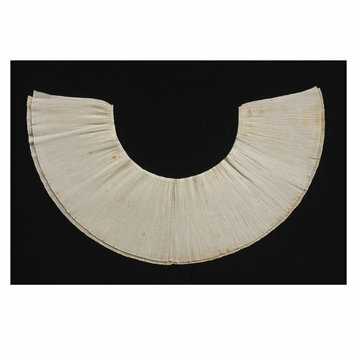 They were used as riding headwear for elite women and as everyday wear for the gentry and middling classes. Hats were also particularly common in rural areas of Britain, understandably as rural people usually spent more time outdoors in fields. 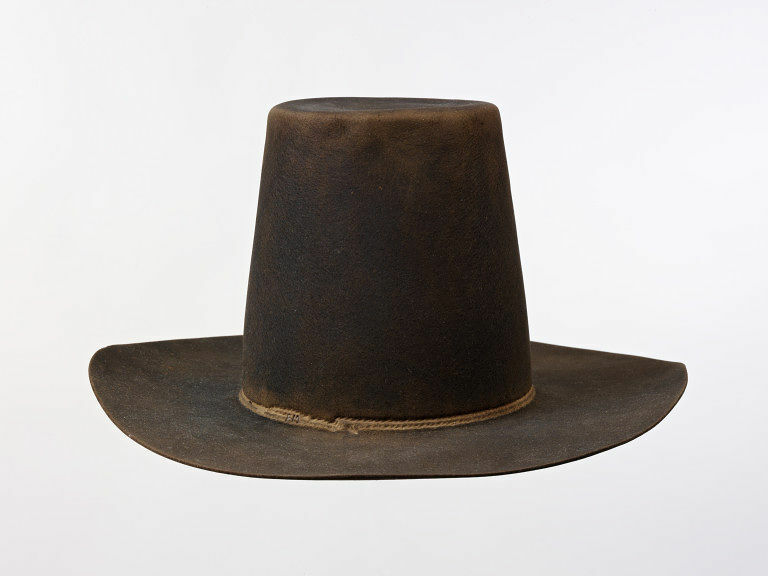 However, as felt hats were still expensive they would probably have had similar styles made from leather. The 1629 probate inventory of Arthur Coke, listed in part of his late wife’s clothing “j  black beaver hatt with a bond of gold smythes – worke of starrs and half moones & iij  other bands of silver & gold”, indicating that the bands on these hats could be incredibly decorative as well. 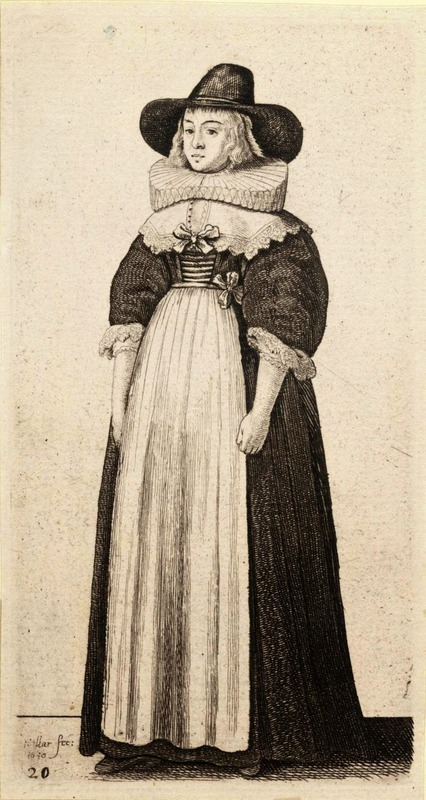 Hats could also be pointed, looking like what we now think of at witches hats, such as the one worn in the painting Mrs Salesbury with her Grandchildren from 1675-6. 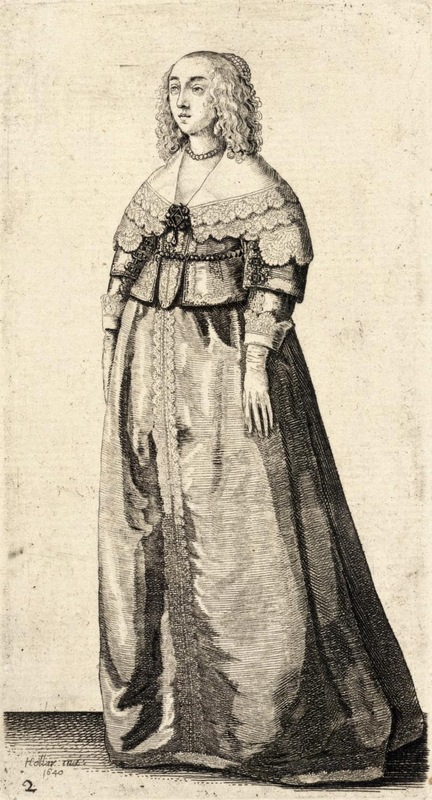 It is interesting that this particular lady is wearing a ruff as by the 1640s falling collars were more the norm. I’ve certainly found no evidence of ruffs in all the probate inventories and household bills that I’ve looked at from the 1630s/40s. Maybe this is an anomaly? On the University of Toronto’s website this picture is listed as “The Kitchen Maid”. She wears a coif, waistcoat, and a couple of petticoats. She is carrying what I assume is vegetables and other foods for the kitchen that she works in. The most interesting detail of this engraving is her shoes, or really what I should say is attached to them. 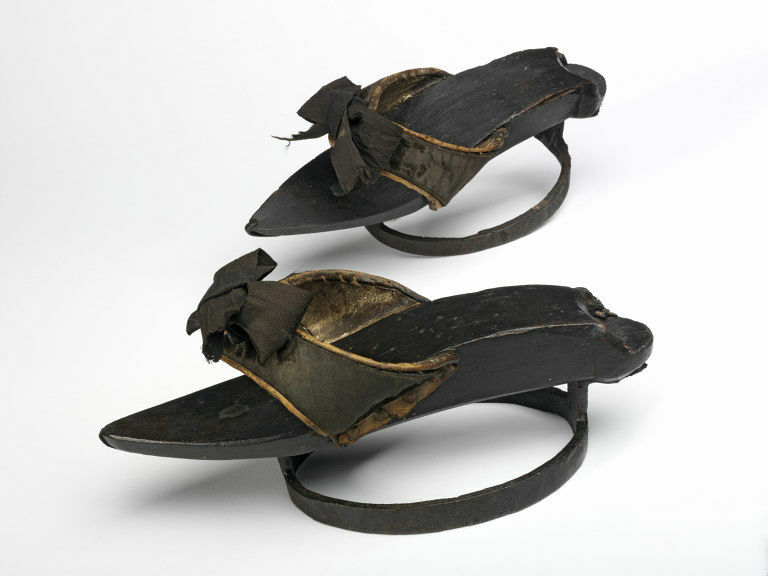 These under-shoes were called ‘pattens’ and were designed to lift the wearer out of the mud and waste of early modern streets. They were usually made from wood or metal and slipped over the shoes on the wearer’s foot. Although primarily worn by common or country women, this pair from the early eighteenth century have pointed toes to fit a fashionable woman’s shoe and a spot at the back for the heel to sit. 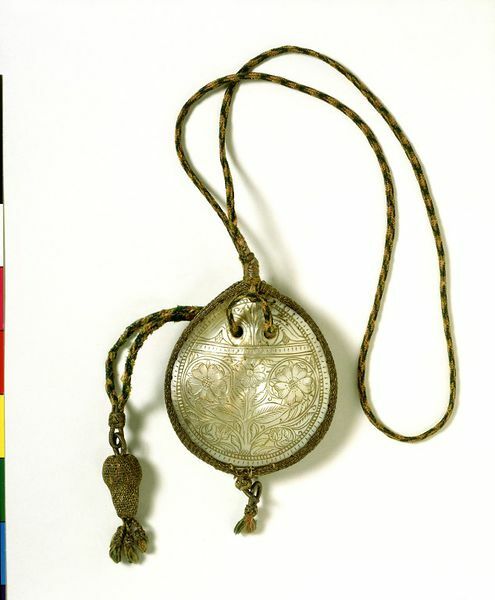 The latchets are also covered in velvet which suggest that they would have been worn by a woman with wealth.